FORMAT is a premier security and loss prevention company in North America offering a broad array of innovative safe products designed specifically to protect your valuable assets, firearms and vital business records. Backed by solid German engineering and craftsmanship with 25+ years of experience and a warranty as solid as the safes themselves, you can rest easy knowing your valuables are safe and secure in our products. Rest assured our quality-driven team is committed to establishing a long-term business relationship by providing you with solid security solutions based on your specific needs. 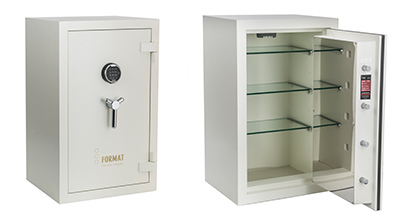 FORMAT carries a wide selection of security solutions for personal or commercial use. Explore our selections of burglary safes, home safes as well as gun safes specifically created to protect and secure your personal and/or business belongings. Our mission is to provide you with peace of mind through meaningful security. 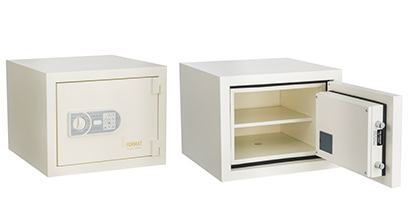 A burglary safe offers a high level of security for valuable items. The high gauge steel and heavy weight will limit a vandal’s opportunity to access your belongings. Knowing thick steel is between potential intruders and your valuables, your peace of mind is guaranteed. Prevent potential disaster by securing your firearms from intruders and accidental use. 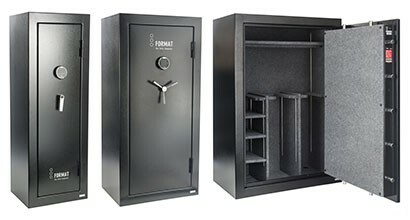 FORMAT safes will keep your firearms safely out of the hands of anyone not authorized to use them. Preparing for the unimaginable not only gives you peace of mind, but also relief if your home ever fell victim to fire. Store your valuable insurance and other documents in a FORMAT residential security container (RSC) for access at a time when needed the most. If you do not find what you are looking for or have a question, ask a safe expert. © 2018 FORMAT USA Inc. All rights reserved.